That’s a lot of books! Now I’m thinking I really need to go through my books and have a giveaway too! I’d love to win The Secrets of Midwifes. I think your low net gain is admirable as well! I’ve been digging through my books and finding some I’d totally forgotten about. In the past, I could tell you if I owned a book or not but those days are gone. Yes! That has been my problem that last few years. That’s why I appreciated that I could really take my time this year (thanks mom!). If you can still afford to add books, you clearly don’t have enough children. Yes, I’ve been receiving a few more books this year, too. Never mind what the books are – 876! That’s crazy! 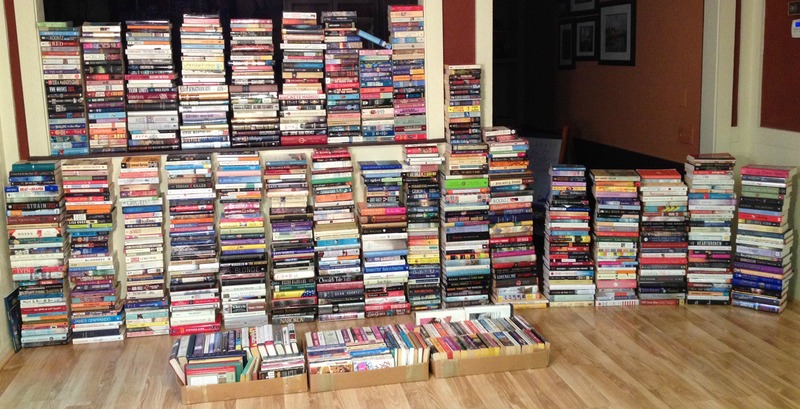 And I thought my 20 TBR books were a lot. I get it, as a fellow book lover would. I am not sure I have an area where I could put all my books together. I am lusting after that hardback of The Fiery Cross, been on the hunt for one of those. It will turn up somewhere and the fun is in the search. I tend to keep anything I rate over a 3, but I am always loaning books that I don’t get back. 876 books and that’s in print! Impressive. The picture is even more impressive. Wonderful. What a collection. 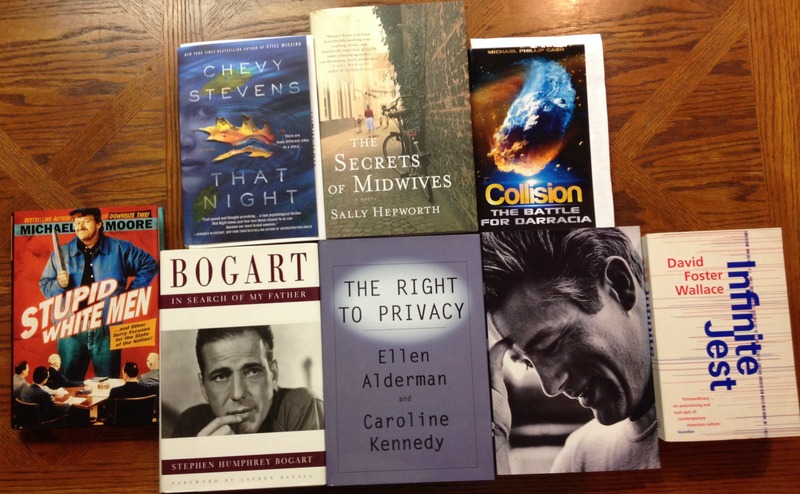 I would love The Secret of Midwives, Bogart, and That Night. Thanks for this giveaway. I would love to win That Night. I fortunately or unfortunately (depending how you want to look at it) don’t have that many print books anymore as I’ve moved several times in my adult life and always give away my print books to charity to save space on the truck. I know that except for rare books I can always replace them. Except for She Reads and an occasional blog tour I’ve managed to stay off publisher’s mailing lists too! I don’t know how some bloggers keep up! I would love to win Infinite Jest, if you would be so kind to enter me. Thanks! Yeah, one day I’ll show my actual shelves of books I’ve read and loved enough to keep. I don’t know why I’ve never shown them! I love knowing that someone else’s TBR collection is as big, if not bigger, than mine. 🙂 I haven’t counted mine up in years (I’m kind of afraid to). I always like keeping track and once a year is just about as much as I can handle right now!